Below are the step-by-step instructions to set up your Mac OS 8 or 9 machine on the TransACT VDSL network. Before continuing, ensure that you have installed the latest Mac TransWEB set up software on your computer. If you do not have this software, call TransACT on 133 061 (option 5) to order a Mac TransWEB CD. Instructions for setting up Mac TransWEB software. 1) Double click the icon called Enternet Settings Alias on the desktop. 2) Ensure your details are entered in as per the screenshot below. Note that the User ID is only the first part of your email address (username). 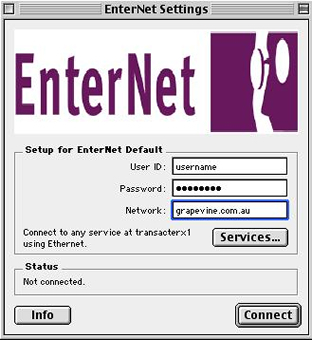 The Network will be the second part of your email address (@grapevine.com.au). 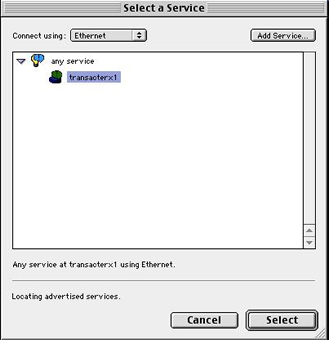 Ensure that "Connect using" has Ethernet selected, and select the TransACT network. 5) Click Connect and you should now be connected to Grapevine.